Welcome to The Hall of Blue Illumination, a podcast dedicated to the world of M.A.R. Barker’s Tékumel. In this episode, our hosts discuss the “fresh off the boat” campaign. The initial premise of this kind of campaign is that the players’ characters are newcomers to the setting of the Empire of the Petal Throne. This framing device presents a convenient mechanism for initiating players into the elaborately detailed environment of Professor Barker’s world. [00:00:42] “Fresh off the boat” (“FOTB”) campaigns and their conveniences. [00:05:03] The civilian harbor of Jakálla (Ts. Músa Jakálla) provides the players a convenient entry point into the city. 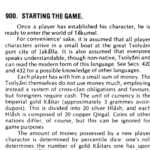 [00:06:58] Rules for generating patrons in EPT (EPT § 1000, p. 38). [00:08:47] The use of nonplayer characters to set up initial encounters (See EPT § 1110, p. 40). [00:10:22] Developing nonplayer characters (EPT § 2830, p. 102). [00:14:00] The significance of the players’ relationship to society in Tékumel relative to other RPGs like D&D. [00:16:08] Victor notes Professor Barker’s reservations regarding early D&D’s inattention to societal context. [00:20:05] The “Ellis Island Approach” to foreign characters’ integration into Tsolyáni society over the course of a campaign. [00:25:24] The Legion of Chulin the Foreigner (Deeds of the Ever-Glorious § 40, p. 51) is a prime example of the possibilities open to successful foreigners in Tsolyánu. [00:29:31] Other cities conducive to FOTB approaches: Sokátis, Khirgár. [00:31:20] James notes the benefits of Jakálla’s relative proximity to the uncharted southern portions of Tékumel. [00:32:30] The use of Pinterest boards as an aid to visualizing the setting of EPT. [00:33:57] FOTB adventure hooks gleaned from the Key to the Map of Jakálla (EPT §3100 (Appendix C), p 111). Deeds of the Ever-Glorious is available as a PDF from RPGNow. Map of Jakálla (from the 1975 edition of EPT) is available as a PDF from RPGNow. Swords & Glory Vol. 1 provides more detail on Jakálla and Tékumel. It is available as a PDF or in print at RPGNow. Although not explicitly referenced in this episode, “Welcome to Jakálla” Michael Cule’s article in in Issue 1 of The Eye of All-Seeing Wonder might also be useful to referees developing fresh off the boat campaigns.